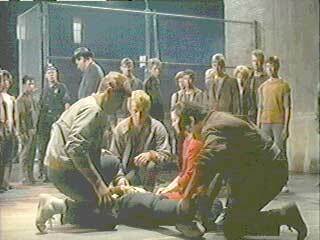 Richard Beymer, George Chakiris and others wear black and optical white low cut Converse “Chuck Taylor” All Stars in the film. Tony and Maria, the star-struck lovers, have an ill-fated romance. 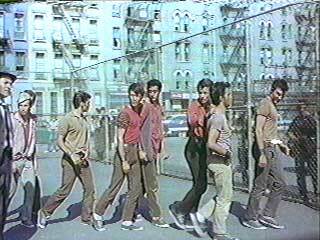 West Side Story was an important film of the early 1960’s and had a profound influence on that generation. Winner of ten Academy Awards including Best Picture, Best Supporting Actor (George Chakiris), Best Supporting Actress (Rita Moreno), and Best Musical Score (Leonard Bernstein), the film is a modern day version of “Romeo and Juliet”. Set in Manhattan’s Hells Kitchen, it presents its story through music and choreography as well as traditional action. The two lovers, Tony and Maria, portrayed by Richard Beymer and Natalie Wood, pursue their ill-fated romances in the context of a gang rivalry between the Sharks (Puerto Ricans) and the Jets (Americans). Like Romeo and Juliet, Tony and Maria try to make their love transcend the suspicion, rivalry, and hatred that the two gangs have toward each other. The Sharks wear black low cuts. West Side Story is an important artistic accomplishment and is responsible for some significant changes in the concept of the filmed musical. Until its release, musicals were always about rather light-hearted subjects, with the story line usually a contrivance to set up song and dance numbers. 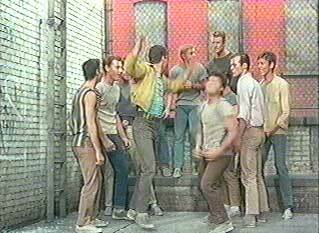 West Side Story’s use of street slang, a dark urban landscape, and the subject of gang warfare were all firsts for this genre. While much of that may seem dated and passé in our 90’s world of constant explicit and graphic violence, this film and the Broadway show that it was based on were quite controversial at the time for introducing this type of reality into a musical. Riff and the Jets try to stay “cool”. You can’t discuss this film, though, without getting into the music. The fantastic score, a collaboration between Leonard Bernstein and Stephen Sondheim, has to be one of the great musical scores of all time, equivalent in impact to that of the opera Carmen (which also combined realistic characters with an incredibly powerful score). The music is still performed and recorded today, as it has been since its release, and remains a strong influence on nearly all of our modern artists. It is significant because of its melding of jazz, avant-garde, Broadway, and Latin-American musical styles, predating the fusion movement by ten years. You can modernize it, perform it in difference types of genres and venues, and still its original melodic and harmonic strength comes through. Tony , with stars in his eyes, telling Riff that “Something’s Coming”. 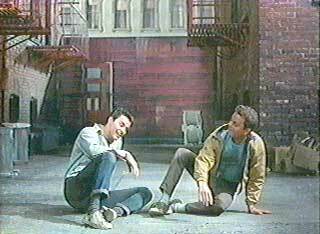 The choreography is also an important facet of West Side Story. A lot of the violence of this film is sublimated by the way that it is expressed through the brilliant dance sequences by Jerome Robbins, and in fact he is given credit as the co-director for the film. The costuming also was trend setting. This is the first example of gangs identified by the color of their sneakers, and that, combined with the choreography, makes for a striking visual effect (white low cuts for the Jets and black low cuts for the Sharks). Maria and the Jets grieve over the fallen Tony. There are hardly any closeup sneaker shots, so that its is hard to tell what the gang members are wearing, although it does appear that Tony and some of the Jests are wearing low cut white chucks, and most of the Sharks are wearing black low cut chucks. The majority of the film is shot using wide angle photography, and closeups primarily focus on facial shots between the principal actors. 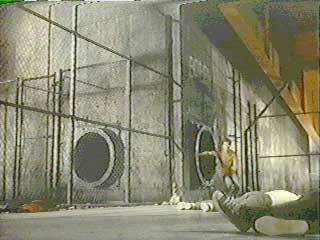 The best scene for chucks are the gang confrontations between the Jets and the Sharks, usually expressed through very athletic ballet sequences. The contrast between dirty white and black sneakers highlights their confrontation. West Side Story. (1961) Natalie Wood, Richard Beymer, George Chakiris, Rita Moreno, Russ Tamblyn. Directed by Robert Wise and Jerome Robbins. Categories: Drama, Musical, Romance.